Thought you would like an update on the black puggie we adopted in April (Orion, now Zeus) He has taken over the house & thinks he is the boss! We love him so much & can not imagine how we managed without him. He & Lucky ( our other pug ) are best friends & play together & sleep together, so cute to see them snuggling in the same bed. After about 3 weeks with us we started leaving him out the crate when we went out for short periods, happy to report the crate has been put away & Zeus is completely trustworthy. 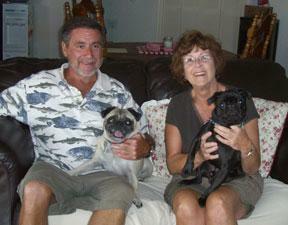 So thank you again for all the good work you do saving the pugs!! At least 8 people in our neighborhood have gone to shelters & rescued a dog as a result of seeing Zeus & hearing about rescue dogs. Our daughter adopted a one year old beagle, he & Zeus are good friends. Wishing you & all the good people who help you a very blessed holiday!